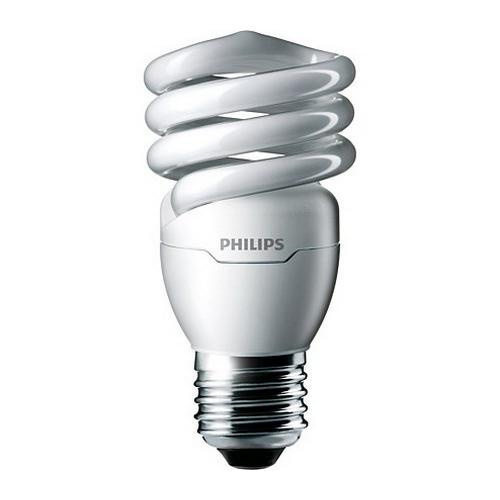 Philips Lighting Energy saver 13-Watt BC-EL/mdTQS T2 6/1 E26 single contact medium screw base compact fluorescent lamp offers 900-Lumens of bright light output. It has efficacy of 67 LPW. Twister lamp has voltage rating of 110 - 127-Volts and current rating of 210-Milli-Amps. It has color rendering index of 81. Lamp with 2700K color temperature rating radiates warm white light to the surrounding. Lamp measures 104.3 mm x 51.5 mm Dia. It comes with average life of 10000 hours.